Safi is a Truthwitch, a trait so rare and valuable that she must keep it secret, for fear of being captured and used by those in power. Iseult is a Treadwitch. She can see the threads that bind people together. The two are Threadsisters, sharing a special bond that connects them like no others. When they find themselves in some trouble and a Bloodwitch catches Safi's scent, the girls are split up and must run for their lives. They are finally reunited and find themselves being protected by Prince Merik, a Windwitch, who may have ulterior plans of his own. It took a long time for me to be able to pick up this book. Honestly, after the extreme hype leading up to its release, I wanted nothing to do with it. I had to wait almost two years for the bad taste in my mouth to go away. I am glad I finally decided to pick it up, though. In general, there were a lot of things that I enjoyed about this book and some things that I wished were handled differently. I found myself easily getting lost in the story, but when I think back on it, I don't actually know much about the world of Safi and Iseult. The book basically drops you right into the action from the beginning. I didn't have a problem with that, but I found that there was a bit too much focus on the action and not enough on the world building. I normally find that most female characters annoy me, but I actually really liked both Safi and Iseult. I did find myself sympathizing and connecting with Iseult more, however. I found that Iseult's magic was more interesting to me than Safi's. While Safi's magic is pretty clear cut (she can tell when someone is lying), Iseult's had so many more intricacies and was developed much more. I found her magic fascinating and can't wait to learn more about it. I also really liked the character of Merik, but I wasn't a fan of the budding romance between him and Safi. The focus of this book was more on the bond between friends instead of romance, which I really appreciated. But, because the focus was not supposed to be on the love story, it made the romance feel jarring and undeveloped. Safi and Merik had no real connections that should make them have feelings for each other, yet they were suddenly madly in love. It didn't make sense at all. It felt like it was shoved in there to please readers who would not have been happy with a book with no romance. It would have been better to have it develop more throughout the series and make readers wait until it felt right. A note on the audiobook version of Truthwitch: I really do not recommend it. The narrator was pretty awful and the voices were so weird. Safi and Iseult sounded so whiny and the accents sometimes sounded German and sometimes Jamaican. Seriously, invest the time in reading this book in print form because it will be a much better use of your time. 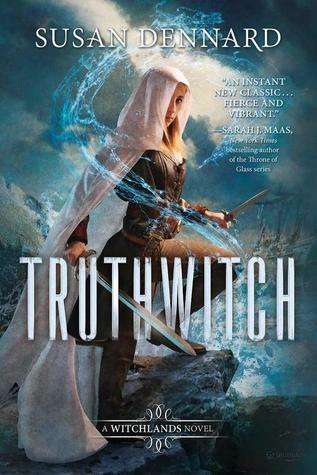 Ultimately, I am glad that I finally picked up Truthwitch because I enjoyed it much more than I expected. Is it on my list of favorite books of all time? No. But I did enjoy getting lost in the story and I will be continuing with the series. I am looking forward to seeing how the series progresses and if any of the points I found disappointing will be developed further in other books.